The Canon Digital IXUS 130 continues the long-standing IXUS tradition of small, stylish and well-built cameras, with the added benefit of being the slimmest model to date. The high price and merely average image quality do take some of the sheen off what is otherwise a very nice point-and-shoot. With its well-constructed metal body, slim profile and classic styling, the IXUS 130 is an understated yet eye-catching camera featuring a tried and trusted design. Beginners in particular will find it easy to use, thanks to a winning combination of logical layout and hand-holding technologies that result in taking better pictures more often. Only the curiously-designed zoom lever detracts from what is otherwise something of a design masterclass. The move to 14 megapixels hasn't been such a good idea, though, with noise quickly becoming all too apparent at the slow ISO speed of 200, with further noise, softening of detail and colour desaturation becoming ever more apparent as you move up the ISO range, making the IXUS 130 ill-suited to low-light photography. I'd love to see an IXUS using one of the new 10 megapixel backlit sensors, as seen in the S90 and G11 cameras, but it seems that more megapixels rules the roost in this style-led sector of the market. Which leads us nicely onto the rather eye-watering price-tag. £279.00 / $249.99 is a lot to pay for what is essentially a point-and-shoot camera with an average zoom, average LCD and average image quality, albeit one with some clever tricks up its sleeve. You really do have to like the IXUS 130's undeniable style to get on board - and that's exactly the kind of person that Canon are marketing this camera towards. 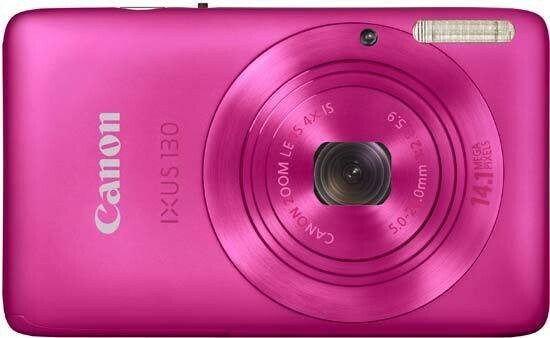 If that sounds like you, then the svelte new Canon Digital IXUS 130 will definitely fit the bill.